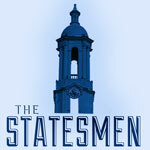 The Statesmen are Penn State's premier all-male a cappella group. Ranging from pop to R&B to classic Penn State songs, the Statesmen are a PSU Proud a cappella group that strives to provide a wide array of genres to their wonderful fans. What started out as an idea at a party in August of 2011 quickly became a staple of both the State College music scene as well as the entire Penn State culture. The Statesmen - originally called the JoePas - donned their rolled-up khakis and ties, performing at PSU football tailgates and other local events. Since then, the group has gone on to receive numerous accolades, including Second Place at the 2012 ICCA Semifinals and Outstanding Soloist for 2012 and 2013 ICCA competitions, among others. Under the direction of the first musical director Jim Hogan, the group was fortunate enough to release their self-titled album in the summer of 2012. The group has also had the opportunity to perform a song off of their debut album on national television (NBC's Today Show). Above all else, the Statesmen are a group of brothers who love each other and love to perform. Keep an ear open on the streets of College Avenue and around the area - you might just hear them performing! Join us for an ice cream social after the show, sponsored by The Penn State Alumni Association - York Chapter!